One of the best tools in marketing is word-of-mouth. However, with the heavy adoption of social media, the old-fashioned face-to-face method is now being replaced by “device-to-device,” and online reviews have taken over as one of the main sources of digital word-of-mouth. That is why it is so important to have quality online reviews. Online reviews are an excellent way to attract new customers. In fact, studies have shown that over 53% of customers regularly read product and service reviews, and 43% of people make a purchasing decision after reading one to three reviews. 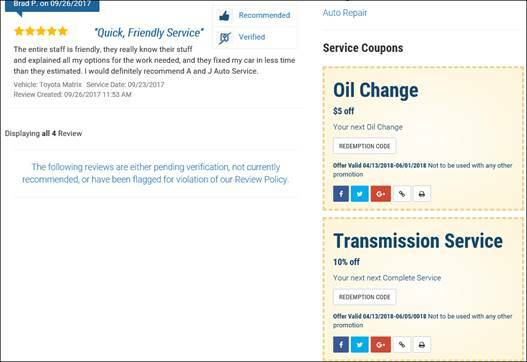 Having this kind of visibility with online reviews really allows you to demonstrate your business’s quality of service, the services offered and your overall brand reputation. Also, managing your reputation online gives you the opportunity to maintain and strengthen relationships with your current customers by responding and engaging with your customer’s reviews through responses. Because customers look for reviews in various places online, leverage your reviews across different platforms, including on your business website, Facebook page and especially a SureCritic Business Review page. A SureCritic page helps your reviews work to your advantage by not only confirming your GREAT reputation and improving your online visibility when customers search for your service but also helps steer customers towards services and promotions. Constantly managing and sharing your reviews across platforms to get the most visibility from prospective customers can sound daunting, and frankly, how often do you have time? Don’t worry about it! There are great services that can help you automate most of this work. For example, Mitchell 1’s SocialCRM Marketing Program has many ways that it can take full advantage of your reviews. Here are just a few of them. Chris Bonneau is the Support & Sales Lead for the Mitchell 1 SocialCRM product line. He joined Mitchell 1 in 2006 and has been in the automotive marketing business for over 8 years.